← The Edonis, the forgotten sports car? Regular readers will know how I lament about modern sports cars. In a way, they are too good, so to get any sort of driving feel or sensation, you have to drive way too fast, which usually ends up with the loss of your license and several years in jail. Back in the day, you could take the ordinary family hatch-back, add a bigger engine and better running gear, and you had a great handling car. 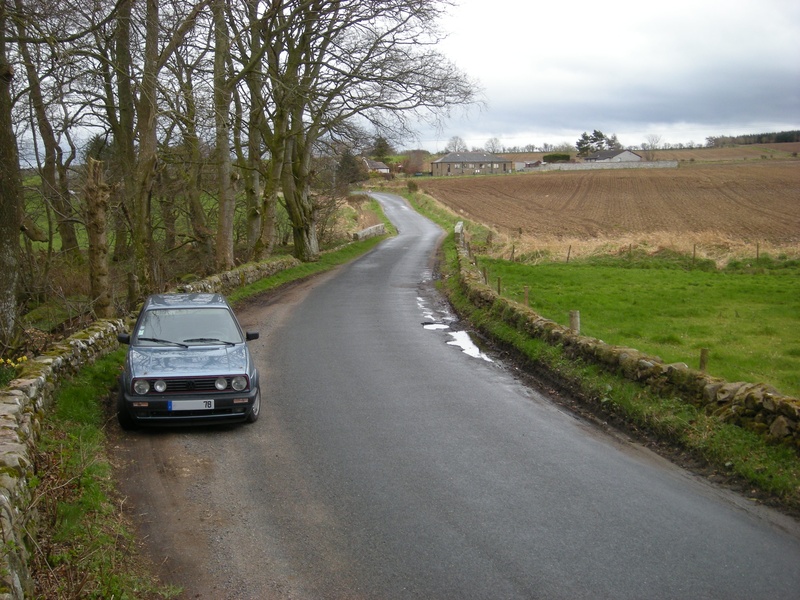 The Mk1 Golf GTI was one of those firsts. Yes, some may argue that it was not the actual first hot hatch-back, but you cannot deny that it was the most successful and launched the craze. What Volkswagen had done, back in 1976, was take their ordinary Golf, put the biggest engine they could, a 1.6 litre, added fuel injection for efficiency, reliability and 110bhp, updated the suspension and steering and presto, they made history. Even if the VW board was not convinced at first, their engineers persevered, and the car was an immediate hit. In 1984, however, with the new bigger Mk2 Golf out, it was time to update the classic. The producers of Die Hard 2, Matrix Reloaded and Iron Man 2 know how hard this can be. If they changed the original too much, the purists would whine and gnash their teeth. So VW took the safe road and did not change much. On the updated Golf, they put the old GTI’s engine (it was now the controversial 1.8 litre, still with 110bhp) and put in the same gearbox and running gear from the old one. The big welcome change though was the braking system, with four disks all around. So, more weight, but same power. Sounds like the Civic Type-R dilemma. Was it actually worse? In a way yes, as the Mk2 did not offer any real performance improvements on the old one. 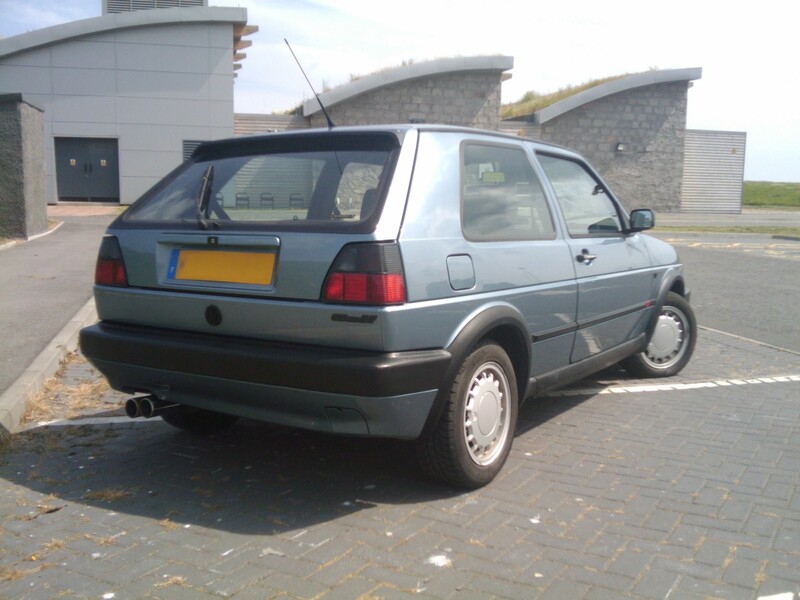 However, because the Mk2 Golf was a big improvement on the original, the GTI was a better car to live with. There was now more compromise, the trend to bigger and heavier hot hatch-backs was starting. The first compromise was the style. That beautiful taut body designed by Giugiaro had to grow in order to accommodate the bigger interior. It was now more rounded, even if the general lines were kept. The trend of incremental improvement had begun here, but personally I liked it. (even if I think the original looks better). 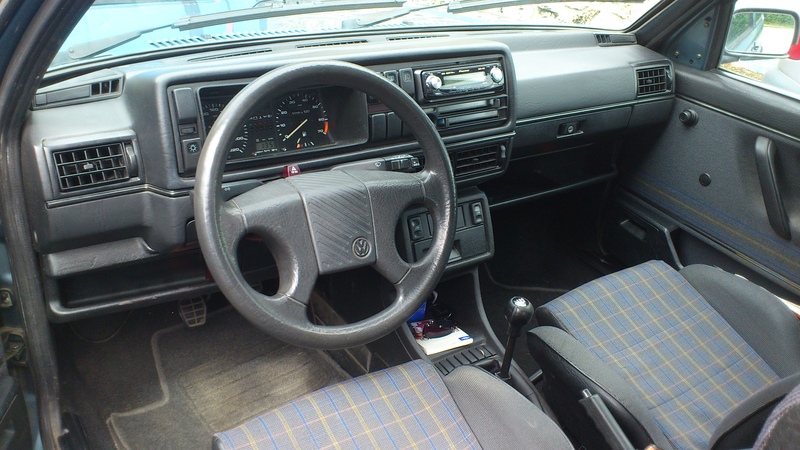 The subtle styling details were kept to differentiate a GTI from the run of the mill Golf. The front fascia had that red contour, the sides had that subtle black body kit, and the rear featured a petite spoiler, combined with twin exhausts. The engine was a big change from the original 1.6 litre. The new 1.8 litre unit was less fun at high revs, but it offered much more torque. As a daily car, it was perfect. Yes, it felt less sporty, since there was no point taking it to the edge (past 5,000 rpm it actually runs out of breath), but on the day to day trip, it was great. Put your foot down anywhere above 1,500 rpm and it would just go. It was so good in the torque end, that it actually bested the beastly Mk2 GTI G60, and that car offered 160bhp with a compressor! Dare I say it, you drove the 8V like a diesel…. However, it did not sound anything like a diesel thankfully. Turn the key and the car wakes up and greets you with a nice growl. At low speeds it knew how to be civilised, but push down on the gas pedal and it would scare the nearest passer-by. In that way, it was just like the original! On the road, the Mk2 GTI felt more secure than the original. Turn the wheel and the car would follow with no drama. Push it to the limit, and you would get some under-steer, but not much. You could still lift the back end wheel in corners, which is always fun, but the car felt less responsive, partly due to the extra weight and suspension setting. However, to come back to the first point of this review, even at relatively low speeds, you could have fun in it, you were not detached from the act of driving. Yes, it was not as good as the original, but the Mk2 still offered a good feel when driving, because everything was still connected to the driver, there was no electronic safety net. When travelling long distances, though, the Mk2 was much better than the Mk1. The new body had a better drag coefficient, and combined with the fuel injected engine this made the fuel consumption really good! On long trips it was also quieter and more refined. You could even call it comfortable. The Mk2 was the perfect GT car back in the day. (I used mine as a cross-country tourer in fact). As a car you would use every day, it was then much better than the original. It felt mature and efficient. More German in a way. I loved mine for that, and frequently drove for hours straight without the slightest hassle. Braking was not that efficient on the other hand. Yes, it was an improvement on the original, with disks all around, however it still was a case of brake and pray you stop in time. Thankfully there is no ABS, so it is up to you to measure the pedal input. Golfs have never been a great performer in this area, along with the fr ont headlights. Inside, you had all the creature comforts you could need, such as electric windows (that worked most of the time), power steering, a huge boot and space for five passengers. The front seats offered good bolstering and where firm enough. You could easily drive hours on end and not feel tired or in pain. The traditional chequered fabric was present, to add a touch of colour in an otherwise grey interior. It was an old VW after all, not very exciting, but everything worked and was superbly put together. My car had 170,000 miles on it, and there was not a single sound coming from the fixtures or fittings. Overall, as a car to use every day, the Mk2 Golf GTI was miles better than the original. As a sports car that offers you pleasure and fun when driving, not really. The problem was the Mk2 had to compromise on a lot of things, in order to offer comfort and performance (exactly like cars today). 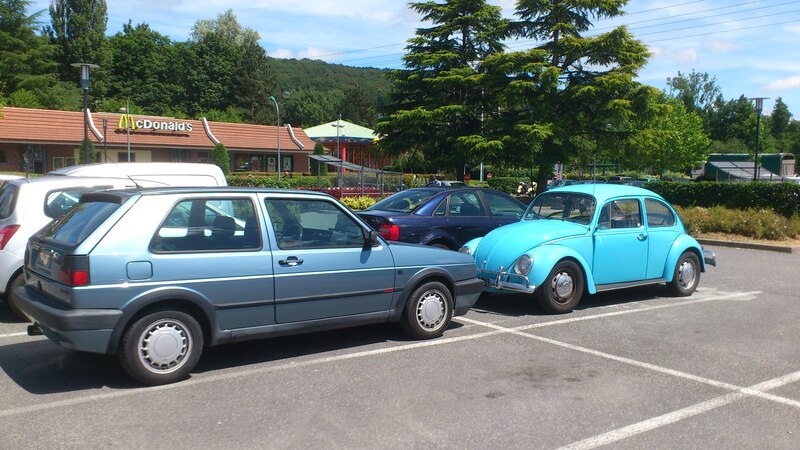 In this case here, power was needed for a more fun car, and luckily VW answered that call with the 16V a year later. Now the Mk2 was becoming a real sports car worthy of the original! Even the brakes improved! 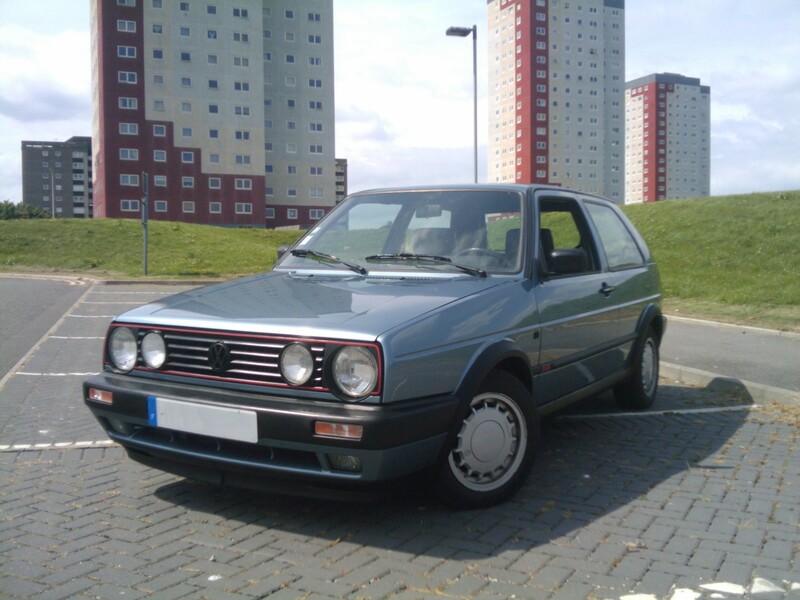 This entry was posted in Car reviews and tagged 8V, driving, golf, gti, hot hatch, Mk2, review, volkswagen. Bookmark the permalink.